Aston Martin will race a pioneering hybrid hydrogen car at the 41st ADAC Zurich 24 Hours of Nürburgring in May. The company claims the Hybrid Hydrogen Rapide S – based on it’s new four-door, four-seat sports car – will become the first hydrogen-powered car to compete in an international event as well as the first zero CO2 emissions sports car to complete a race pace lap at the Nürburgring 24-hour race. With project partner Alset Global from Austria, Aston Martin’s engineers have developed a prototype twin turbocharged 6.0-litre V12 engine that will power the Nürburgring car. 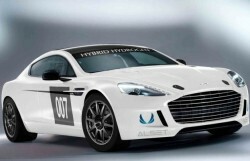 The Aston Martin Rapide S will use Alset Global’s Hybrid Hydrogen system to run on pure gasoline or hydrogen or a blend of both. In pure hydrogen mode, Aston Martin and Alset Global aim to show that a zero CO2 emissions lap of the Nordschleife is possible while emitting virtually only water from the exhaust. Alset Global’s Hybrid Hydrogen system comprises a hydrogen fuel supply system, hydrogen tank and proprietary engine management system. The strength of the Hybrid Hydrogen technology is related to the flexibility of controlling the combustion process according to each particular driving situation: either pure hydrogen, gasoline or an arbitrary blend of both can be selected to ensure optimum power, acceleration and CO2 reduction. This intelligent combustion control results in a propulsion system that provides sports car performance but with the carbon footprint of a supermini. Welcoming the debut of the Hybrid Hydrogen Rapide S, Aston Martin Chief Executive Officer Dr Ulrich Bez said: “As we celebrate our centenary in 2013 and look back on a century of excitement, innovation and style it’s also the perfect time to look to the future with this astonishing race car. Alset Global’s patented technology, developed over the past eight years, overcomes the lack of a fully developed fuelling hydrogen infrastructure. The simplicity of the Hybrid Hydrogen system means only minimal changes are needed to fit it to conventional engines, thus bringing hydrogen mobility ‘out of the laboratory’ and onto the streets. The ease of introduction and expected premium of just 15 % over today’s new car prices mean that lower CO2 emission target levels, legislated for 2015 and 2020, are now achievable and affordable. Launching the technology on Aston Martin’s Rapide S race car will highlight other benefits the Hybrid Hydrogen technology offers. By taking part in one of the toughest races in the world, Alset Global will underline both the reliability and safety of hydrogen technology today. Four carbon-fibre tanks holding 3.23 kg of gaseous hydrogen – two housed next to the driver and two in the trunk of the car – and the refuelling system developed by Alset Global and its partners are approved by German motorsport’s governing body, the DMSB. In addition, the use of the existing 6.0 litre engine will showcase that engine downsizing or electrification is not the only way to achieve low emissions. Redesigned and re-engineered to offer even greater style and significantly enhanced performance by virtue of its new AM11 6.0-litre V12 naturally aspirated engine, the new Rapide S is capable of 190 mph and sprints from 0 to 62 mph in only 4.9 seconds. Aston Martin returns to compete in the ADAC Zurich Nürburgring 24 Hours on May 19-20 for the eight successive year. More than 150 cars will start the 24-hour race, which runs on the daunting 25km circuit that combines the legendary Nordschleife with the modern Grand Prix track.